During Lung Cancer Awareness Month in November, please acknowledge ALL who are afflicted by lung cancer. Encouraging people to stop smoking is a worthy cause, but must you hold the Great American Smokeout during Lung Cancer Awareness Month? It fuels the unjust stigma attached to lung cancer. Lung cancer is caused by more factors than just smoking–80% of those newly diagnosed are never smokers (like me) or nonsmokers who quit decades ago. Lung cancer among never smokers is the sixth leading cause of cancer deaths. WHO recently published a study linking lung cancer to air pollution. Other studies link lung cancer to exposure to radon in homes and arsenic in water sources. All you need to get lung cancer is lungs. Please acknowledge this publicly, especially during Lung Cancer Awareness Month, and consider moving the Great American Smokeout to any month other than November. If you agree, please consider signing this petition to the American Cancer Society. The petition was created by Betsy Thompson for the Lung Cancer Survivors Foundation. It’s important to do this because 160,000 people a year die from lung cancer. Lung cancer 5 year survival rates at 16% are essentially unchanged since 1975. The stigma associated with smoking has resulted in severe underfunding for lung cancer as compared to other cancers – $10 are spent on research for every breast cancer death as compared to $1 per death for lung cancer. We must stop the stigma and making villains out of smokers makes things worse. No where other than in lung cancer is so much “hate” aimed at the victim. Where is the hate for the tobacco companies that spent billions on researching and developing additives and delivery methods that maximize the addictiveness of smoking to the point where smoking is shown by epidemiological studies to be more addictive than heroin? Where is the compassion for the person smoking, who started at age 13 or 14 enticed by the tobacco company targeted advertising and then was unable to quit despite numerous attempts (see my previous point on addiction). We have so villain zed smokers that we have failed to address the enormous toll of lung cancer on our nation, our health care services and on the patients and care givers. The leading cause of cancer deaths in the US and world wide and predicted to increase even more as baby boomers age into the riskiest age group. Please help by supporting lung cancer. After all you are the American CANCER society and lung cancer is the leading cause of cancer deaths! Yes, we must keep working to erase the stigma of lung cancer. 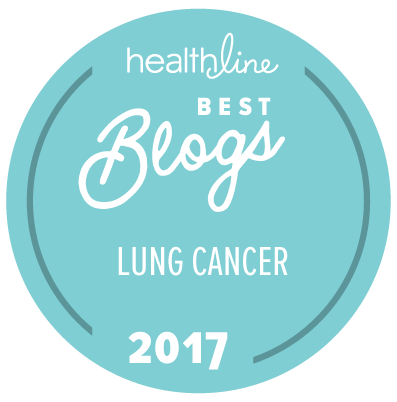 Thanks for advocating for lung cancer patients! All you need to get lung cancer is lungs!